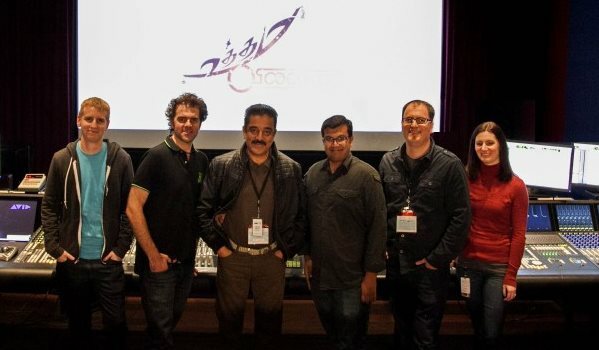 Canadian sound mixer Craig Mann, who pocketed an Oscar for his work in "Whiplash", has also worked on Kamal Haasan-starrer Tamil drama "Uttama Villain". Congratulating Craig on the win, Kamal said he felt like his team had won the award. "When I asked my sound designer Kunal to get the very best to mix our film 'Uttama Villain', he came up with this name Craig Mann. And I'm glad the Oscars also agreed with that selection. We were talking about 'Whiplash' and he had the humility to say the next best in sound mixing was in 'Birdman'," Kamal said in a video. "I liked his magnanimity and I like the patience with which he has mixed our film. It felt like our team got the Oscar, though we have nothing to do with 'Whiplash'. We just feel like we are part of the team. I'd like to wish everybody who helped Craig win this honour," he said. Kamal added that he's proud of Craig and said they may probably do more work together. Directed by Ramesh Arvind, "Uttama Villain" is slated for April 2 release. It also features Pooja Kumar, Andrea Jeremiah, Urvashi, K. Balachander, K. Vishwanath and Jayaram in important roles. Sound designer Kunal Rajan, who had previously worked with Kamal on "Vishwaroopam" and "Vishwaroopam 2", also worked on "Uttama Villain". "Thanks Kunal for putting me on to Craig. I think you have this uncanny midas touch of rubbing shoulders with Oscar winners. I've heard the mix of 'Uttama Villain', which he did with the same interest as he'd do an international film," he added.